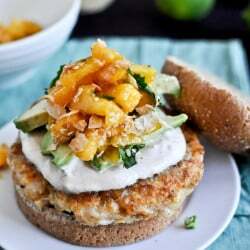 Shrimp Burgers with Chipotle Cream and Coconut Peach Salsa. 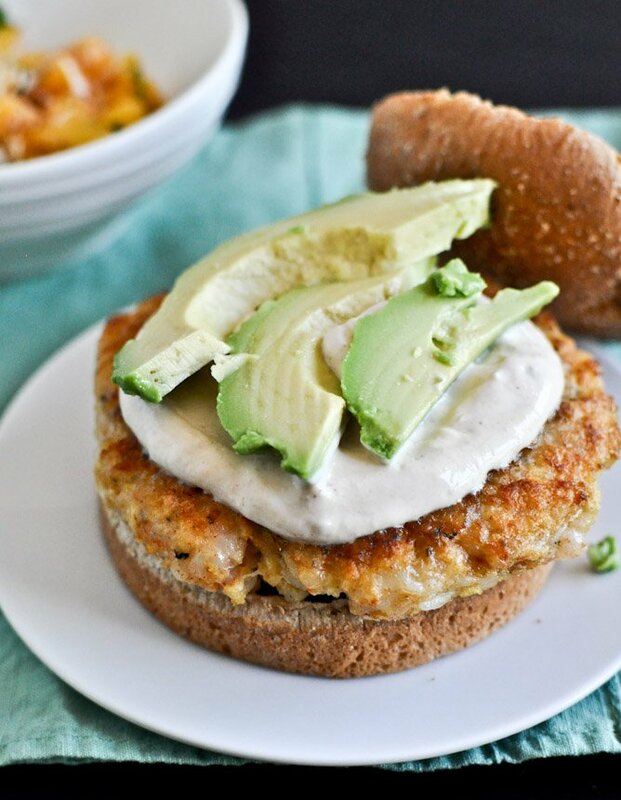 Dinner in the form of shrimp burgers. I’m also thinking grilled corn. And for the past two days I’ve been obsessed with the idea of a grilled corn, avocado and blueberry salad. With butter lettuce, of course. Because it’s BUTTER lettuce people. Don’t say no. I’m also adding in some really crunchy kettle chips, most likely because it’s 100 degrees and I am currently burnt to a crisp. Cherry red. Pink flamingo. Totally refusing to stand in front of the stove anytime soon. And white wine… really, really crisp white wine that is ice cold. This is like my dream meal at the moment, darnit. I would probably pay a hefty, unreasonable amount of money for someone to bring me this burger wrapped in parchment while I sit in an adirondack chair on the beach. It sounds very fair to me. So like… I guess I have this little fascination with turning some of my favorite seafood items into burgers. After the tilapia burgers – which were SO good… no, really… so, so good – I was hooked. I figured those burgers would be pretty tasty, but was blown away by how much flavor they packed and how delicious they were enveloped in a toasted whole grain bun and topped with watermelon salsa. I had no idea what I was in for. And the best part is that I actually think I like these shrimp burgers BETTER. I ate one six days in a row since I was playing single lady and seriously? I couldn’t get enough. And we all know how bored I get. Bored of routine, bored of the same meals, bored of life in general when it doesn’t include sprinkles and glitter and sparkling cocktails. I’m secretly 12 years old. I threw some toasted coconut in a tossed-together salsa not only to starve off my boredom, but also because coconut shrimp is the best and I wanted to do something that slightly mimicked it. Right? And this is like, sort of that. And incredibly fabulous. 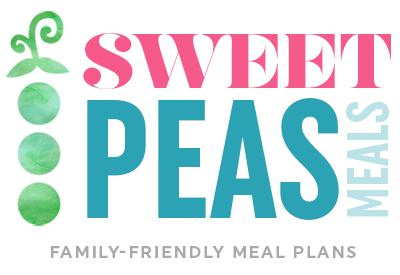 And on our dinner party menu! Don’t be late. Add shrimp to a food processor and pulse until chopped. Transfer to a bowl and add egg, panko, garlic, mustard, salt, pepper, paprika, onion powder and basil. Mix until combined, then form tilapia into patties (form tightly with your hands, trying to prevent cracking). Heat a skillet oven medium heat and add half of the olive oil, then cook patties until golden on each side, about 3-4 minutes. Repeat with remaining burgers. In a bowl, stir together sour cream, chipotle sauce, lime juice and a pinch of salt and pepper. 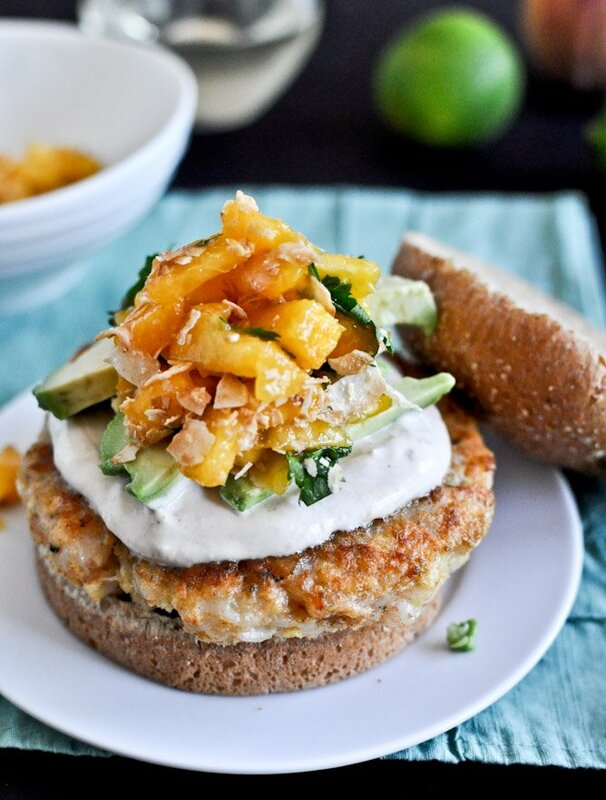 Spread on top of burgers, then layer with avocado and peach salsa! For salsa: Stir ingredients together and serves on top of burgers! One day I topped this with bacon. Also do that. Roasted Blueberry Coconut Quinoa Parfaits with Coconut Granola. I made these shrimp burgers last night and wanted to weep they were so good. I replaced the onion powder with some chopped Vidalia onion. And I used your avocado mash recipe (with the sea salt, pepper and lime) as the topping to the burger. Want to make this 100 times more this week alone. Really this is just my favorite blog in the world. You’re awesome sauce! I just need to thank you for posting this amazing meal. My super picky family loved every bite and wanted more! All the flavors are in sync and are perfection, thanks we so enjoyed this! This recipe looks devine. I am a huge seafood fan, shrimp, tilapia, crab, you name it! And a coconut So excited I have all of these ingredients, just waiting to form these burgers. A newly housewife with much time on her hands. To the Author:You seem very funny, and have great taste. Glad I found your website! coconut lover*, seems as if I’m on a food high. Looks A.M.A.Z.I.N.G! But one question, you fry them in the oven? Not on a pan? Love this recipe Jess! The Coconut Peach Salsa looks amazing. Will definitely make these!! Love the recipe, love your style of writing, and your photography! Must tell you pinterest works. I came here because someone pinned this, I clicked on it and I am now your newest subscribed reader. Would these be just as delicious without the salsa? No one in my family is a fan of peach, plus I just don’t want to make it, lol. Is there something store bought that would work, like mango salsa? Sounds like a great recipe, I can’t wait to try it! I make Shrimp Burgers with a similar recipe which included some lime zest. I pan fried them in a little garlic butter and served them on a toasted bun with lettuce, tomato and avocado…..what a hit!! The good news-bad news is that you have to prepare and eat them in short order. They are good cold and sort of OK when nuked. Best when hot and sizzling. While cruising the net, I came across Chef Big Shake’s Original Shrimp Burgers from http://www.TheQuickShipWarehouse.com . They come frozen and have a year shelf life. Pretty easy to prepare and quite good which makes it nice when the spirit moves you. After cooking, we squeeze a little fresh lime on them and add the avocado. Voilà! Sounds like a great recipe, I can’t wait to try it! I make Shrimp Burgers with a similar recipe which include some lime zest. I pan fried them in a little garlic butter and served them on a toasted bun with lettuce, tomato and avocado…..what a hit!! Wow another winner, Jess! Made these today (ate without the bun). We all loved this! Only change I made was eliminating cilantro since I’m one of those weirdos who feel like it tastes like soap. :). Thanks for posting!!! This recipe looks amazing! I just have one question; you have written “Mix until combined, then form tilapia into patties”…tilapia? I thought these were with shrimp? Just noticed that in the recipe you have tilapia instead of shrimp in the third sentence of the recipe. Just thought you might want to change it! :) Thanks, can’t wait to try this recipe!